Wow! What a day yesterday turned out to be, Cabin Crawl, Wine Tasting and Poker run. This is the second one we attended. And this one was even better. We feel like we made even more friends. Perhaps it was the wine or maybe there were a lot less participants so we stayed longer in each cabin. The crawl started at 3:15pm and ended in our cabin around 6:15pm. The money that was won was donated to an orphanage in Manta today. One of the passengers was born in Ecuador and was planning to visit an orphanage today. Gloria donated the money she won as the worst poker hand. Anyway Brad matched the total winnings and our friend Susan added to the winnings to make it $100. A good time was had by all. 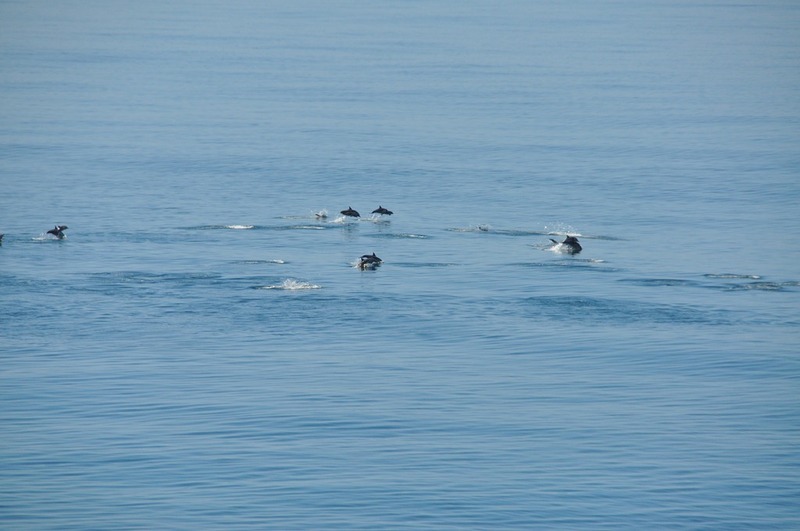 A school of Dolphins swam by the ship. We could not believe all the dolphins we saw today. There were large groups of them just playing and jumping. The water was actually dark with them in spots. These were smaller dolphins than we had seen before. This evening we had dinner with our regular Aussie table mates. Our friend Susan joined us. We had a great time. The Aussies were difficult for us to understand when the cruise began. After a few days we could understand them. Well, for Susan it was like the first time was for us. She had a great time and so did the rest of us. All in all it was a really great day. A few night ago we shared with you that we had attended the Belgian dinner. 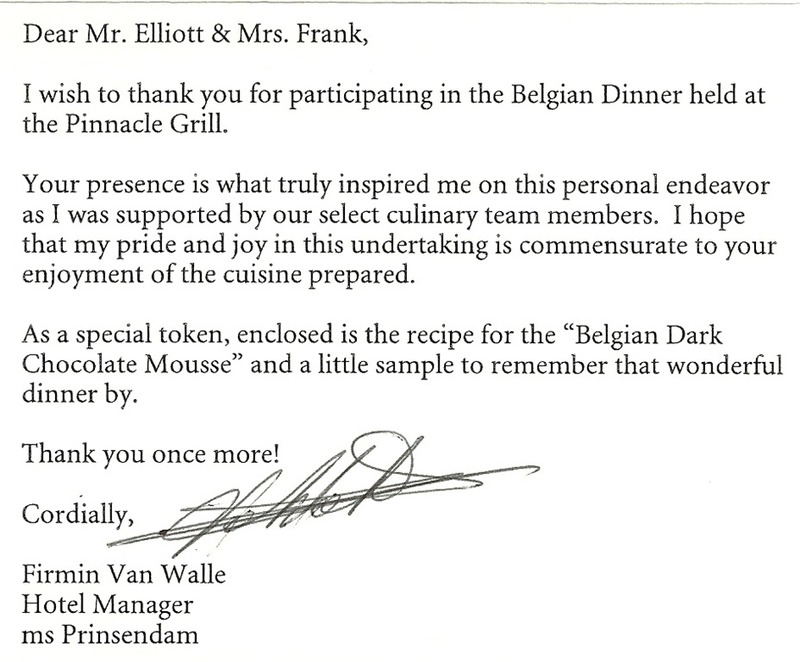 This morning we received a lovely note from the Hotel Manager and his recipe for the wonderful Belgian Dark Chocolate Mousse. This entry was posted in Travel and tagged Dolphin, Ecuador, Manta. Bookmark the permalink. I have enjoyed reading your blogs. Sounds like you find plenty to keep you busy. I never stop while cruising. 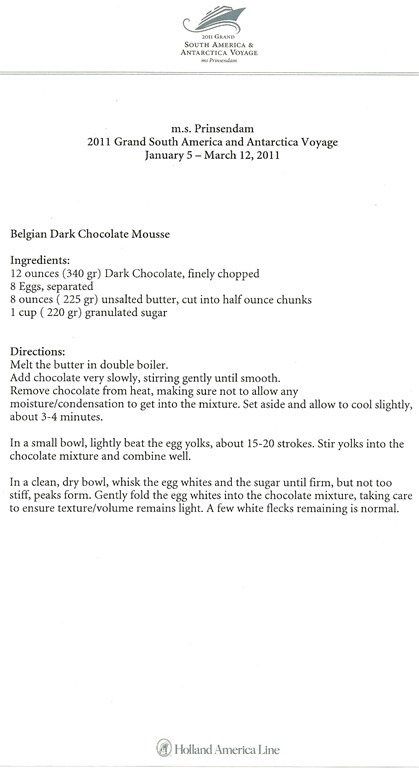 Anyway, the Belgian Choc. Mouse sounds wonderful. There were no instructions for cooking this so I assume the egg yolks are to be eaten raw. If you haven’t killed over by now, I guess the egg yolks were okay uncooked. Have a good time and continue to make fond memories and new friends. Thanks, when we cruised with you I was cruising with Leslie (wife). I do cruise with Gloria (ex-wife) as poor Leslie gets sea sick.